There is something about a child’s handprint that is just completely precious. Just think of all your own handprint art your parents saved from when you were little. Those tiny handprints bring special feelings of nostalgia. 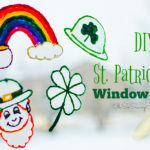 This adorable St. Patrick’s Day Handprint Rainbow Craft is such a fun way to get into the St. Patrick’s Day spirit and remember your little one’s early years. Disclosure: This article contains affiliate links. 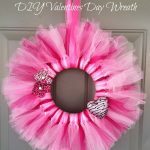 If you choose to purchase through the links (thank you!) I will receive a small commission. Did you know that New York City held the first St. Patrick’s Day parade all the way back in 1762? Pretty cool. With loads of Irish heritage, I love celebrating both the fun and the historical sides of St. Patrick’s Day! 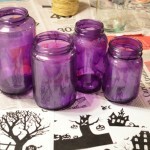 This week in Mom’s Day Out, I thought it would be so much fun to do a Handprint Rainbow Craft. 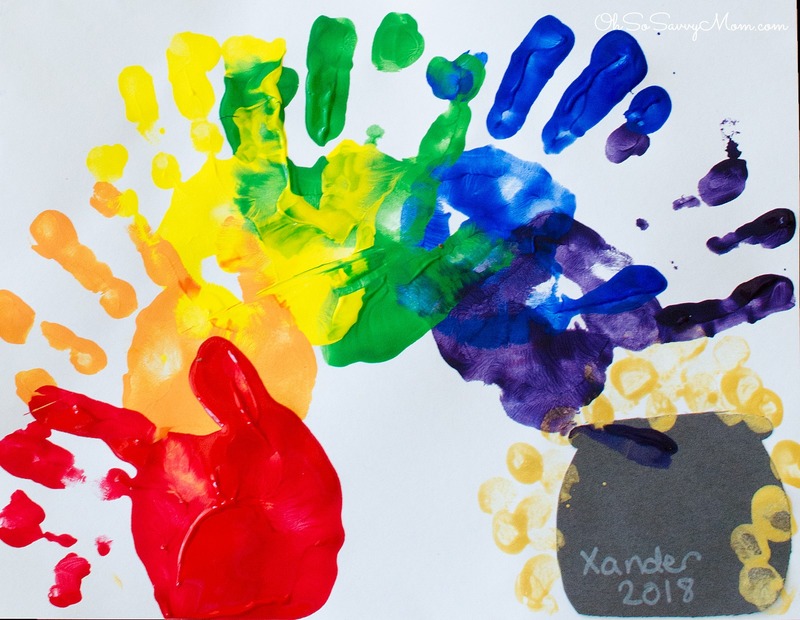 I’d never done any preschool handprint crafts for Mom’s Day Out before and thought that this was the perfect activity to help parents remember this special time when their kids are little. 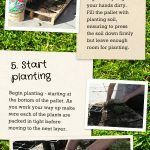 Before I go ahead with the instructions here are a few tips for you as well as a couple things I’d do differently next time. If you have a foam roller it will make the activity so much easier. At the preschool where I work we use these. Instead of dipping the kids hands in paint, like I had to do at home, roll the tempra paint onto their hands. Much less messy, and you’ll use a lot less paint. 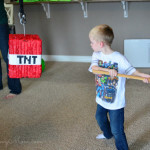 Give about 5 minutes per child to do this activity. If you have butcher paper or an extra long sheet of art paper you don’t have to overlap the handprints. 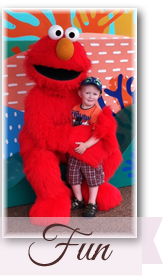 If you’re using standard 8.5×11 cardstock, you’ll need to overlap the hands a bit to fit all the handprints in. I used my excellent preschool skills and mixed my primary colors tempra paints to get the orange and purple colors. If you have all the colors premixed more power to ya. 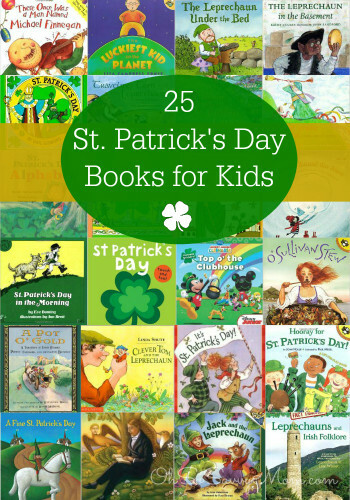 After getting the kids in the St. Patrick’s Day spirit by telling a little history about St. Patrick and reading a cute St. Patrick’s Day book for kids, I set out with their instructions for the project. 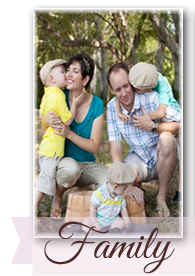 Before you begin, you’ll need to have the white cardstock and the pot cut out for their leprechaun gold. 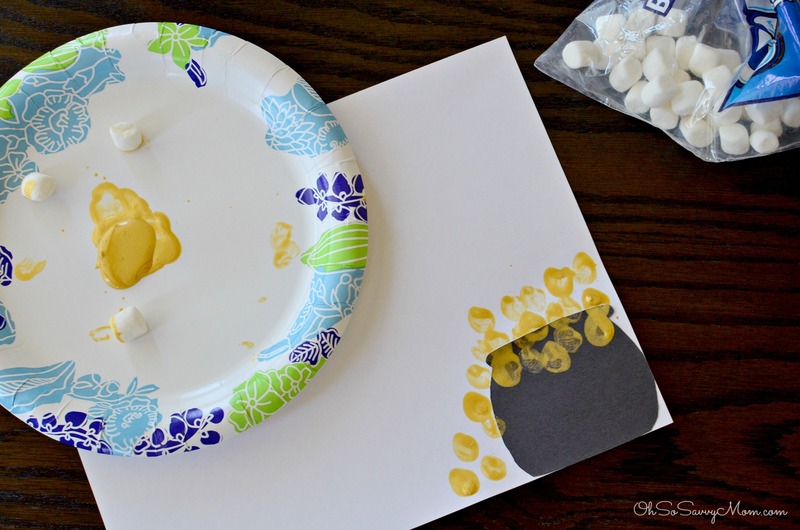 Prepare a paper plate with gold tempra paint and one marshmallow per child. 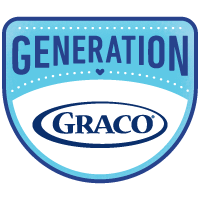 Instruct the children to apply their gluestick to the bottom right corner of their cardstock. Then have them place the black pot on the glue in the corner. 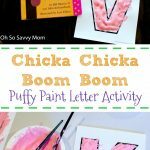 Next, instruct them to carefully hold the marshmallow with their fingertips, dip the marshmallow in the gold paint, and dot the paint onto their papers on top and to the side of the pot. 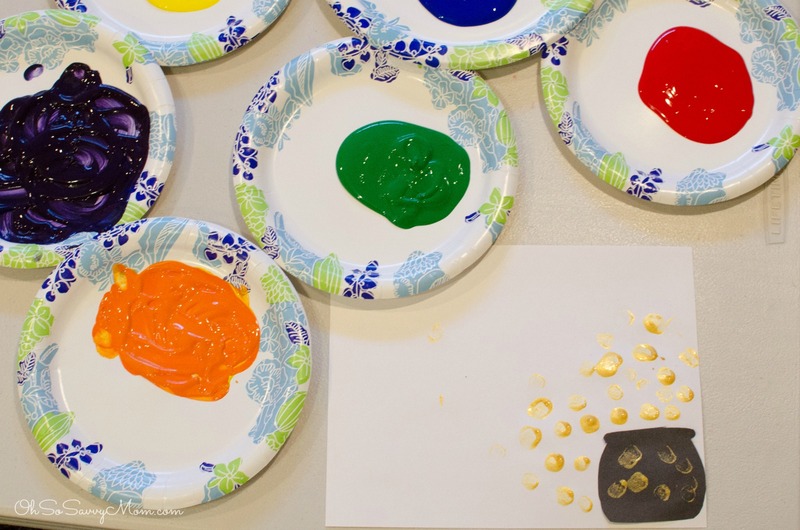 Allow 5-10 minutes for gold paint to dry before proceeding to the next step. 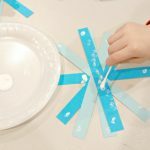 If you’re working in a classroom setting and are doing this project with multiple children, make sure to do each child’s handprints one at a time. Paint the child’s hand with the first color or have the child place their hand in the paint. Place their hand firmly on the paper. Repeat step 6 with each color. 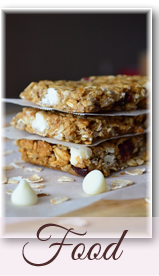 Allow 20 minutes to dry outside or 1+ hours to dry inside. 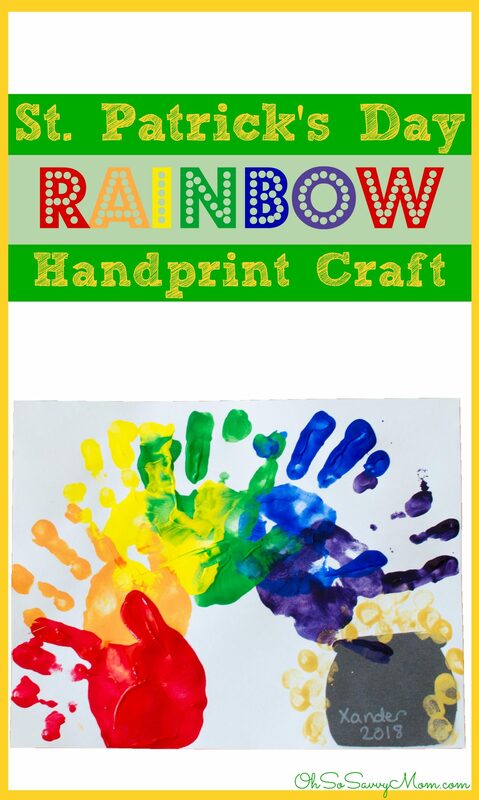 This St. Patrick’s Day Handprint Rainbow Craft is easy enough for toddlers, preschoolers, and kindergartners! 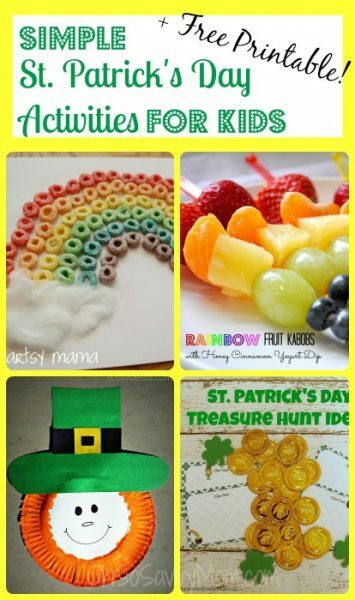 If you’re looking for other fun or easy St. Patrick’s Day Crafts for kids, make sure you check out these Easy St. Patrick’s Day Activities for Kids! 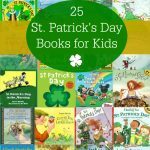 If you’re looking for great St. Patrick’s Day books your kids will love make sure you check out this awesome collection of St. Patrick’s Day Books for kids!